The US Treasury Department has announced that the federal government is likely to borrow $444 billion from the market in the second half of 2013. The Treasury expected to issue $209 billion in net marketable debt in the July-September quarter of this year, assuming a cash balance of $95 billion at the end of September, the department said in a statement. During the October-December quarter, the department expected to issue $235 billion, assuming a cash balance of $80 billion at the end of December. The budget deficit of the US federal government topped around $1.1 trillion in last year’s financial year ending in September. US federal government debt has increased dramatically in recent years due to the financial crisis. In the 2009 financial year, the US federal government ran a record budget deficit of $1.41 trillion and a $1.29 trillion imbalance in the 2010 fiscal year. 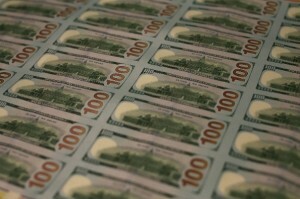 US Treasury bonds owned overseas accounted for $5.4 trillion of the national debt in July 2012. China is the biggest foreign owner of US debt. Foreign investors sold $37.3 billion in long-term US securities in April, the largest outflow in at least three years. China has also slashed its holdings in April by $5.4 billion to $1.265 trillion.